Investors beware: These 5 global crises are likely to rattle the stock market and world economy. No political actor dominated the global stage in 2014 like Vladimir Putin. He meddled in Ukraine and successfully annexed Crimea, but now Putin looks like he overplayed his hand. 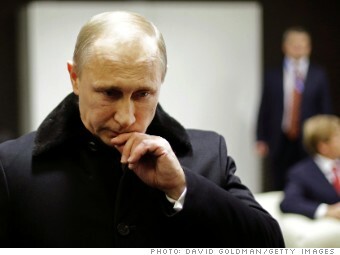 Tough sanctions from the West and plunging oil prices have left Moscow with a scary currency crisis. The fear is that Putin could turn to new aggression to distract Russians from the economic trouble. "What's dangerous about Russia is that it's a wounded bear," said Ed Yardeni, president of investment advisory firm Yardeni Research. Putin could resume saber-rattling in former Soviet states that have significant Russian populations like Estonia and Latvia, each of which are members of NATO (unlike Ukraine). The hope is that Moscow's financial mess will keep the country in check. "Russia has been effectively defanged," said Yardeni. "They don't have the resources to conduct the kind of imperialistic policies that Putin was having delusions about."